“It is with tremendous sadness that we report the news that our Patron and friend, Bernard Middleton, has died. He was 94. 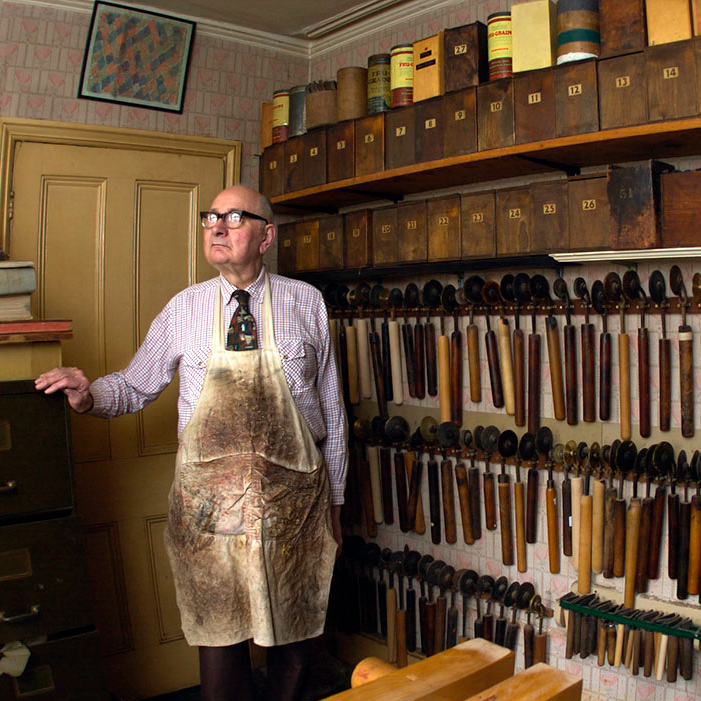 Bernard was one of the most influential and respected bookbinders of our time. During his extraordinarily long career Bernard touched the lives of bookbinders everywhere. He was an inspiration to generations of people who came into the craft, as a scholar and historian, as a pioneer of restoration, and as a leading light in the world of design binding. Bernard followed his father into bookbinding, training at the Central School of Arts and Crafts and the British Museum. After military service, he finished his apprenticeship, attended evening classes at the London School of Printing, and soon afterwards began teaching at the Royal College of Art and LSP. For two years he was manager at the famous firm of Zaehnsdorf’s, then in 1953 he and Dora set up in business for themselves in Soho. Since 1960 Bernard lived and worked in Clapham, south London. Bernard’s work as a restorer was legendary: collectors and book sellers all over the world marvelled as his mastery. He also, more than any of his contemporaries, developed a passion for the history of the craft. His large library of books on bookbinding enabled him to write many articles on the subject, and in 1963, his great work, A History of English Bookbinding Technique was published. Bernard’s book collection is now housed at the Carey Library at the Rochester Institute of Technology in New York. In 2000 RIT hosted a memorable conference to celebrate its opening. Bernard’s other major book was The Restoration of Leather Bindings, which summed up all he had learnt or developed at the bench. This remains an invaluable guide to many who make their living restoring books. Bernard was a founder member of the Guild of Contemporary Bookbinders (later Designer Bookbinders). He was a Fellow and President of DB, and honourary Fellow and patron of SoB. Above all he was a courteous, modest and gentle man, and a great friend to many. He will sadly missed.